If your dietary goals include making as much of a mess as possible, I have a recipe for you. First, devote huge swaths of the nation’s best farmland to grains and beans in monocrops. Drench them in petrochemical-based fertilizers and poisons, much of which will run off into groundwater. Then, instead of eating the resulting mountains of grains and beans—that would be far too efficient—feed them to animals. To ensure that you’re creating as overwhelming a waste problem as possible, concentrate them by the thousands into vast pens and cages. Keeping them alive and growing in such cramped, unsanitary conditions will require staggering loads of antibiotics, thus providing an excellent breeding ground for antibiotic-resistant pathogens. OK, now run those animals through factory-scale slaughterhouses. Slaughtering them at such scale will require unthinkable amounts of clean water, and ensure a gusher wastewater teaming with dangerous nitrates and other poisons. Ship the resulting meat across the country in refrigerated trucks. Still hungry? Cook some industrial meat—or let a fast-food chain do so for you. Bonus: Focus on species that would otherwise turn something humans can’t digest—grass—into meat. Cows fit the bill—in fact, grain diets make them sick, requiring more pharmaceuticals to keep them alive until slaughter. That, in a nutshell, is the story told by Environmental Working Group’s Meat Eater’s Guide to Climate Change and Health. Everyone who eats industrially produced meat should read it. Below is a teaser. 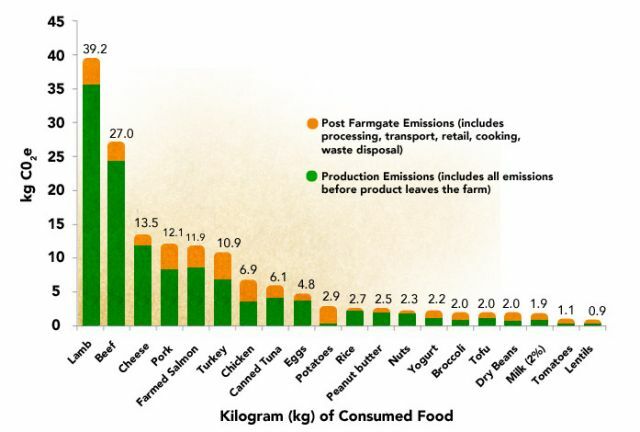 Lamb is our most carbon-intensive foodstuff, EWG reports, but Americans barely eat any lamb. We do eat lots and lots of beef, though, and that habit contributes mightily to climate change. Note that cheese ranks third—kind of tragic, given that the USDA is working with the food industry to get more cheese into fast-food items. Big Mac Attack: Changing the climate one burger at a time.